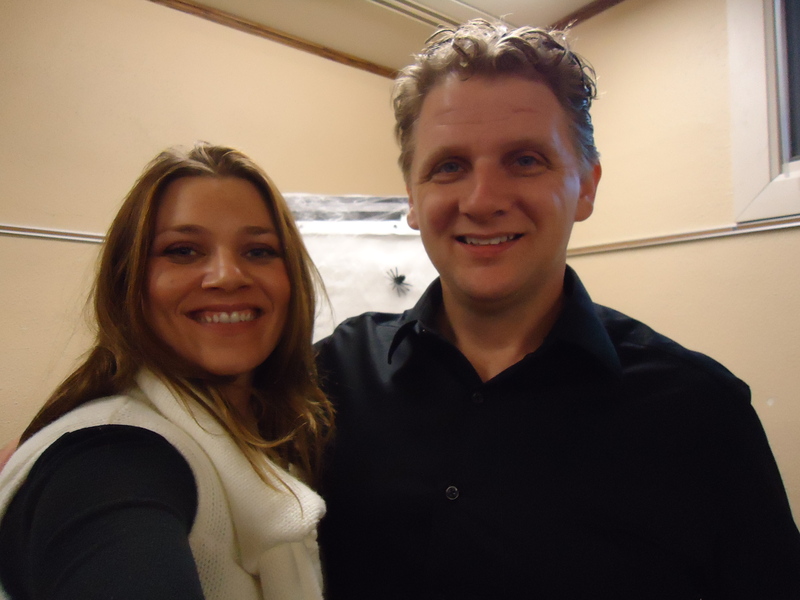 Recently, I was lucky enough to catch a presentation by author and paranormal investigator Chad Lewis when he was in Apple Valley, MN. After listening to him talk about local ghost stories, trips to Transylvania to hunt vampires and other things unexplained, I knew I had to chat with him. So I channeled my inner-crazy-fan-girl and hung out after his presentation, at which time I might have threatened to stalk him until he met with me so I could interview him for my blog. He agreed to let me know the next time he was in the area and kindly donated an autographed book for me to use as a give-away. Behold – Chad Lewis and I posing for a photo! If you look closely, you’ll notice a rather large spider crawling toward Chad’s shoulder. When Chad saw that creepy-crawler coming at him and screamed like a little girl, I pulled out my best judo-chop and saved the day (Okay, that’s totally not true – it was plastic, but I’m a fiction writer – I kind of can’t help myself). So when he emailed and said he’d be presenting nearby, I did a little happy dance, slipped on my new military-styled boots (which my 7 year-old daughter convinced me I needed to buy so I could wear them whenever I go ghost hunting), and took a mini-road trip. We decided to meet in the tavern across the street from the library where he would be speaking that evening. 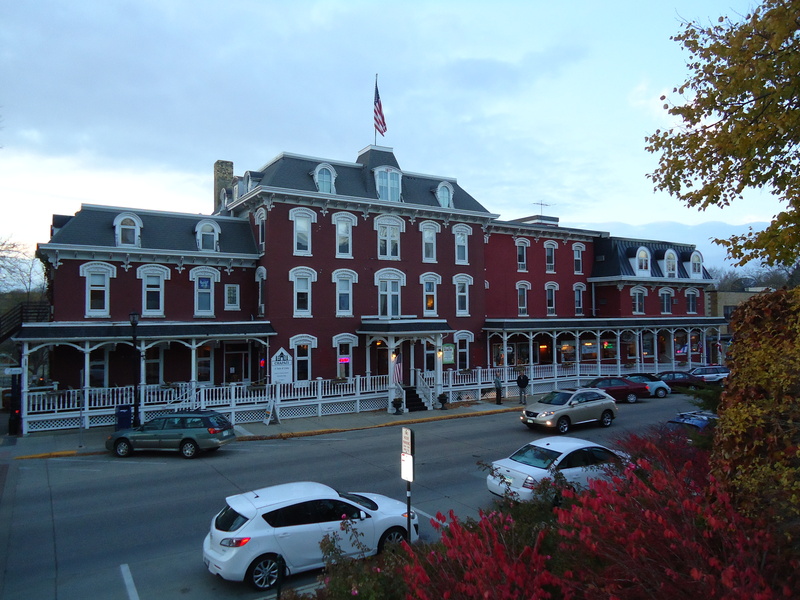 The tavern was located in the historic Archer House, which was built in 1877. As I walked toward the building, I couldn’t help but think that it looked like the perfect setting to have a discussion about ghosts. If you saw a woman standing on top of the Northfield Library sign last week with her camera aimed at the inn, it was NOT me taking this picture (okay, it totally was). 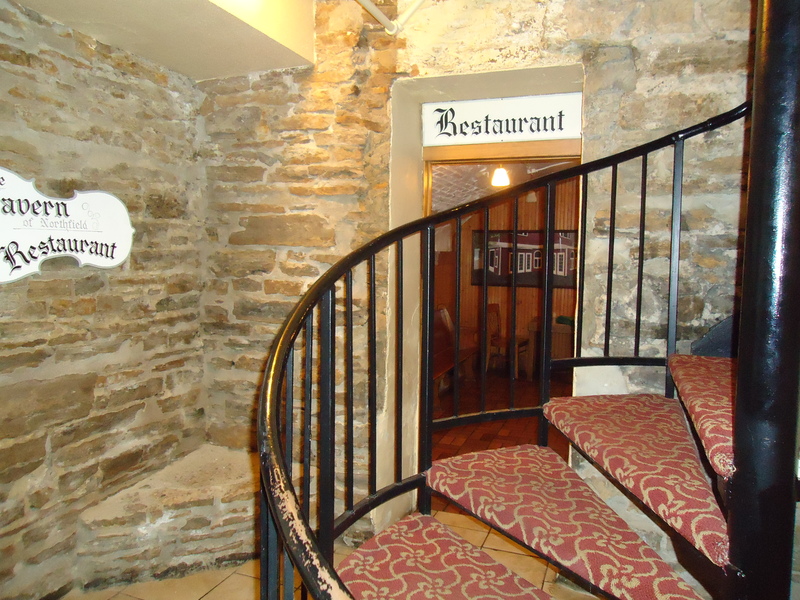 As I made my way down the spiral staircase toward the basement of the Archer House, where the tavern is located, I had to snap a couple of pictures so I could show you all how cool this place is. 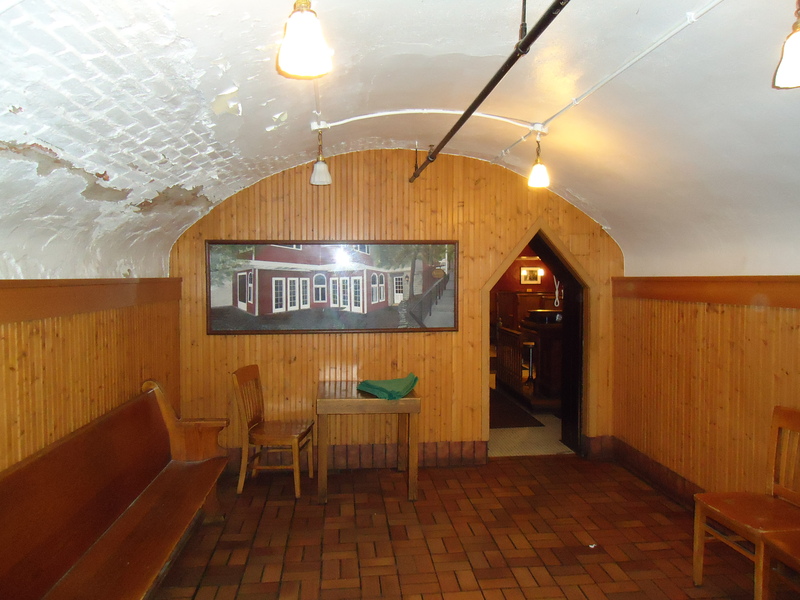 The small tunnel into the tavern. I’m not sure why I loved this feature of the entry, but I totally did! I was so excited about the creepy-coolness of the location we were meeting, I almost forgot that I still needed to think of some intelligent interview questions (because I like to completely stress myself out and do things as last minute as possible – shh…don’t tell anyone I’m a procrastinater – it’s so embarrassing). Luckily, I had forewarned Chad that I am NOT a real journalist and I had never interviewed anyone in my life, so his expectations were properly low coming into our meeting. The view from the table I sat at while I put together my interview questions. 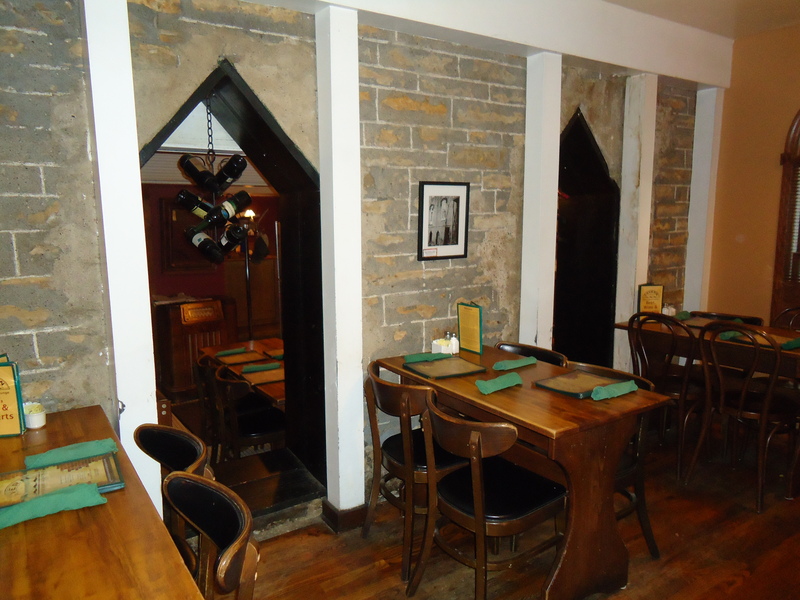 I love any place with exposed brick walls, but the cut-outs overlooking the lower portion of the tavern make this wall extra cool! I’m sure the suspense is killing you, so here it is…my interview with Chad Lewis! 1) What got Chad into the field of paranormal research? He grew up near Elmwood, WI which hosts an annual UFO Days festival because of the astounding number of unexplained things that have been witnessed in the area. Attending this celebration planted a seed for an interest in understanding the unexplained. Chad earned undergraduate and graduate degrees in psychology at which time he began to study why some people believe in the paranormal and others do not. When presenting his findings on campus, people began to approach him, wondering if he could investigate their own paranormal experiences. 2) What is the best haunted location he’s been to? Rural Transylvania where there is no electricity and people travel by horse and buggies. Walking alone at night, carrying a vampire kit…well, I don’t think I need to explain why that would be creepy. The most frightening investigation he’s ever done was in Belize when they were searching for La Llorona (sometimes called the Woman in White), who, according to legend, lures men to follow her into the forest. Of course these men are never seen again. When Chad’s group investigated the legend of La Llorona, they had to travel down a crocodile infested river in Belize at night on a raft. The combination of being aboard a “canoe” that wasn’t safe enough to “float in a bathtub” with crocodiles swimming around them while they searched for a man killing woman in the forest along the banks made this expedition especially creepy. Locally, the creepiest locations he’s visited are Ed Gein’s farm and the Death Curve in Illinois (both of which you can read about in his book THE MOST GRUESOME HAUNTINGS OF THE MIDWEST). 3) What is the lamest location he’s been to? He’s not a huge fan of big city haunts because evidence is easily contaminated by the presence of people not involved in the investigation. He also thought a haunted Subway restaurant he visited in Wisconsin was pretty lame. 4) What is the scariest thing he’s seen on an investigation? His first response was, “Besides the people?” (which almost made me laugh wine through my nose). He said it’s usually little things, like something strange caught on audio or visual that they can’t quite explain. Or instances like the time he turned around and felt his EMF meter hit something/someone, but nothing was there. 5) Has he ever been to the Villisca House? Thoughts/advice?? His advice was to dress warm. There’s no electricity, so it’ll be nice and chilly in December. He also suggested I bring toys – especially anything from the era when the children had lived, if possible. He said that using toys or crayons with paper can sometimes get a response in locations where children are believed to haunt. 6) What is his paranormal investigating advice for a newbie? He encouraged me to have fun with it – don’t get so caught up in the science that I forget to feel the power of the legend. 7) Who is Chad’s favorite author? First of all, he failed this question because he didn’t say me (totally kidding). His all-time favorite author if Robert Ripley (of BELIEVE IT OR NOT fame). He also loves the ODD BALL Series by Jerome Pohlen which highlights strange places in various states (such as a miniature golf course at a funeral home in Illinois). Is anyone surprised that the guy who likes to chase vampires in Transylvania and men-killing women in Belize would enjoy reading about odd attractions he could road trip to with his family? 8) What is Chad’s favorite scary movie? The Exorcist is both his favorite and least favorite. After some serious discussion (with his graduate and undergraduate degrees and my minor in psychology – hey don’t laugh at my minimal psychoanalysis skills) we concluded that he had been traumatized by this movie because he had watched it when he was too young – much like how I watched Poltergeist too early in my youth creating an eternal irrational fear of closets and toy clowns (is it just me or are toy clowns like the creepiest toys ever invented?!). 9) What are Chad’s thoughts on psychics? He had a psychic reading once when you was 21 and vacationing in New Orleans. He was rather unimpressed. Although he does bring psychics along on investigations, and they have proven to know things intuitively that they would have no way of knowing. 10) After years of investigating the paranormal, does Chad believe in ghosts? His response was, “It depends on the day you ask me.” He believes things are happening, but he’s not sure what they are. He’s not sure which legends or ghost stories he believes in – maybe none of them or maybe all of them. In the end, he’s left with more questions than answers. Well, how did I do on my first interview ever? Are you impressed beyond words, or what?! I can almost see your head nodding enthusiastically right now and I’m pretty sure a few of you are thinking, “This chick is the best interviewer of all time!” (thank you – you’re so kind). As we wrapped up our chat, I concluded that Chad Lewis has one of the coolest jobs EVER, and he’s a heck of a nice guy! He donated another autographed book for me to use as a prize for contests on this blog. Speaking of, remember if you leave a comment this month and share your favorite Halloween memory you could win one of those books! And if you happen to be anywhere near where he’s doing a presentation, I highly recommend going! Book Trailer Photo – Sneak Peek! You did a great job on your interview. I just couldn’t stop reading. ; ) Sounds like a creepy field to me! Thanks, Mindy! 🙂 Just wait until I drag you ghost hunting with me!